The hospital is located near at Chimanganj police station and 2 Km far from the Railway station and Bus stand (Dewas gate) and 55 Km far from Indore Airport. At the OPD level, all the 14 Departments are representing their existence for the welfare of humanity & benefit of patients. The total bed strength is 100, which are allocated among different Departments as per occupancy. There is a provision for additional three private wards in the hospital. The only Ayurveda college & Hospital in M.P. which is declared as "STATE MODEL INSTITUTE" in M.P. by the Department "Ayush" of Govt. of India. Treatment through Ayurveda for all the diseases in the departmental O.P.D. 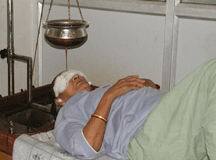 Special treatment are given by Panchakarma, Ksharasutra, General Herbal Medicine, Naturopathy and Yoga & Physiotherapy. 100 bedded well-facilitated I.P.D. with both General and Special wards. Medicines distributed free of cost for all O.P.D. & I.P.D. patients. Cottage and Cubical Wards are also available in the Indoor Hospital. There is much demand for these wards with patients always waiting in for their turn. Sufficient medicines are available both in OPD and IPD are dispensed free of cost to patients. The treatments offered by this hospital are; Kayachikitsa, Panchakarma, Shalya Tantra, Shalakya Tantra, Prasuti-Stri Roga and Bal Roga. Well known Specific treatment facilities are also available at the highest proficiency - Ksharsutra Therapy and Panchakarma Therapy - Vamana karma (Emesis Therapy), Virechana Karma (Purgation Therapy). Anuvasan Therapy (Unctuous Enema Therapy), Niruh Vasti Therapy (Decoction Enema Therapy), Nasya Therapy (Errhine Therapy). Ayurveda treatment for chronic Gynecological disorder like Leucorrhoea, Menorrhagia, Dysmenorrhoea are also given. Ayurvedic treatment given by highly qualified and experienced Ayurvedic physicians and surgeons and special ayurveda consultancy for Chronic and complicated disorders are given by highly qualified & efficient Ayurveda physicians. The Registration charge for O.P.D. is Rs. 2/- and I.P.D. 10/- Rs. only which are nominal. The College has a Pharmacy manufacturing various types of medicines to meet the partial requirements of indoor and outdoor hospitals as well as for research purposes. The manufacturing of medicines used in the treatment of general diseases. Routine pathological, Biochemical & Serological tests are available at nominal costs. The hospital has X-rays & ECG facilities are also providing to general public by this hospital. Address: Near Chimanganj Police Station, Agar Road, Ujjain, Madhya Pradesh.